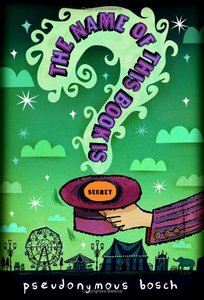 The Name of this Book is Secret by Pseudonymous Bosch is an extremely funny book. It is about a girl named Cassandra (Cass) and a boy named Max-Ernest who go on an adventure that brings into account the fact that most people can't keep a secret. The book begins with you meeting Cass, a survivalist, who carries around a back-pack that contains everything you would ever need in the case of an natural disaster (volcanoes, floods, radio activity, etc.). When a real estate agent gives Cass' uncles a box from a dead woman's home she makes a very interesting discovery. Along the way she meets a kid named Max-Earnest (named that for specific reasons) who seems to be an allergic to everything book-nerd, who helps Cass greatly over the course of the book. My favorite character isn't in the first book (Yo-Yoji), so I'm going to write about my second favorite character, Pseudonymous Bosch. I know, I know, he's the author, allow me to explain. During the book, he makes all these really funny comments about what the kids are doing at that point in time. Also, he makes some pretty amusing footnotes on the bottom of the pages. Also, in the beginning of some of the books, it has a little bunch of pages that are mostly him going "Mmmmmmmmmmmmmmmmmmmmm chocolate.....". Also in the first few books he has an appendix that has a lot of things that he mentions in his footnotes. My favorite thing in the appendix is the recipe for Cass' banana chocolate chip trail mix. I never tried it, though it sounds really good! Keep an eye out for the sequel, If You're Reading This, It's Too Late! u should read homestuck, it's a thing online thats a comic sorta thing, it's really good, but they swear a ton! my favorite quote, "dude i need to talk to karkat,""umm.. hes to busy being slpped by the guy who likes knives,"!! !